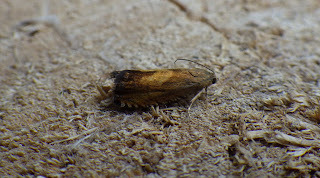 On Sunday 23/7, I visited the North Dock dunes (for only c. 20 mins) and, among the few moths recorded, was a single diamond-back seen on the crucifer Diplotaxes tenuifolia; the grass-moth Agriphila latistria was also noted. Above: back again at the mouth of the Tywi estuary - looking across to Llansteffan. Above: 6-spot burnets on greater knapweed. Monday (24/7) evening saw me at Ferryside, primarily looking at the narrow dune area and scrub between the railway station and the foreshore to where I had gone to see if I could find any mined goosefoots, but none were seen. 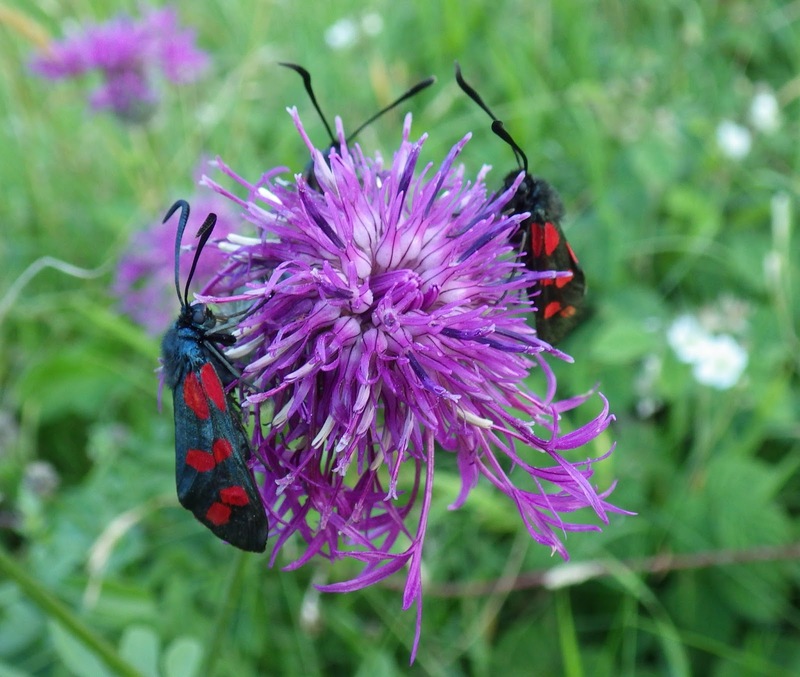 As with the previous locality, 6-spot burnets were out in force with some on flowers of Centaurea scabiosa (greater knapweed) a plant that has its strongest Carmarthenshire population at this locality. Agapeta zoegana was also seen around this plant at dusk with Eucosma cana flitting around Centaurea nigra (common knapweed). A. latistria was also seen at this sandy grassland site. Tuesday afternoon (25/7) saw a stroll to Cefn Padrig shingle beach which is only about a 10 minute walk from my home. Again Agriphila latistria was noted at the saltmarsh/dune interface (I was actually looking for one of the scarcer upper saltmarsh grass-moths), but the best find was a Pammene gallicana spotted resting on a grass stem, the first time that I`ve had this moth away from the Machynys-Morfa brownfield sites a few miles along the coast. Unfortunately, I tried to be `clever` and whilst I was able to get the camera reasonably close to it, the gusting wind was moving the vegetation so much that, when I tried to hold the stem with one hand, it flew off. I should have just netted it and done a `glass tube shot`! Above: the shingle beach at Cefn Padrig. Above: ...and looking back landwards from the shingle. My house is obscured by trees just above the rusty jetty (in the approximate middle of the photo, left-click on pic to enlarge). Note the abundance of wild carrot which has been suggested as the food-plant of Pammene gallicana. 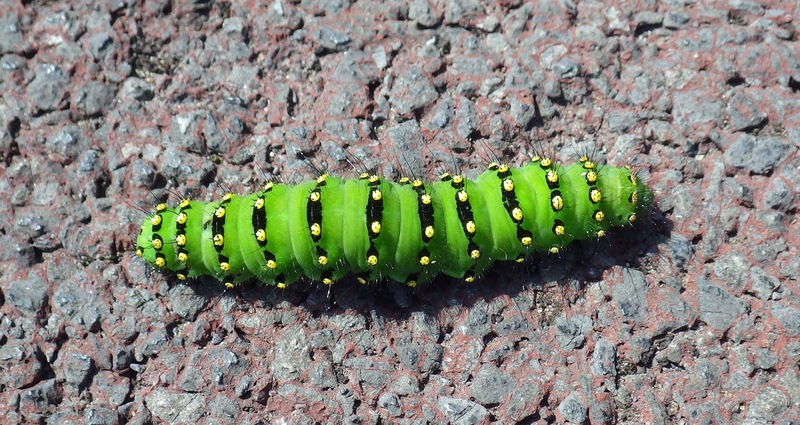 Above: also going for a stroll in Tuesday afternoon`s warm sunshine was this emperor caterpillar, note on the tarmacadam of the coastal cycle track. I helped it to the other side. 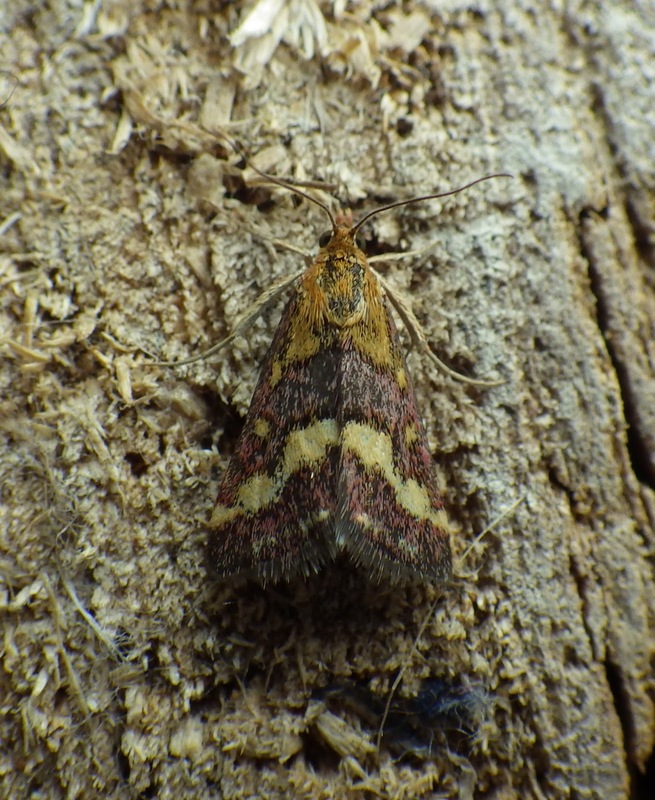 Tuesday evening offered a short pre-shopping visit to a brownfield site at Morfa (Llanelli) where, along with a few other species, a single Pyrausta purpuralis was caught. There are stands of the food-plant, marjoram, nearby. I also noted some nice stands of marsh woundwort and thought of that capture reported on the Ceredigion moth blog of a tortricid (Endothenia quadrimaculana) associated with this plant. Last night (25/7), in spite of the forecast overnight heavy rain - which was also predicted for the following morning at `trap inspection time`, I put out one trap in the garden at Pwll. It was indeed raining heavily this morning and I did n`t bother to record most of the moths (which I`ve had anyway in the last week or so). Indeed, I only wrote down four-spotted footman ( a female), the sycamore-associate Pammene aurita and, a bit of a surprise, Pyrausta ostrinalis. 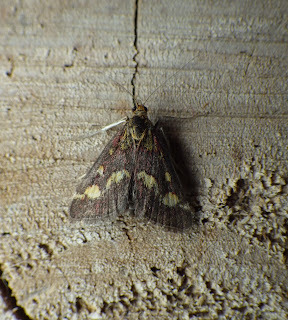 Above: Pyrausta ostrinalis. 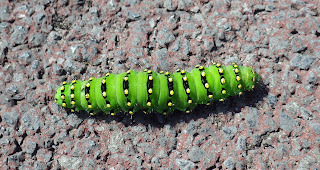 New to my garden trap site. 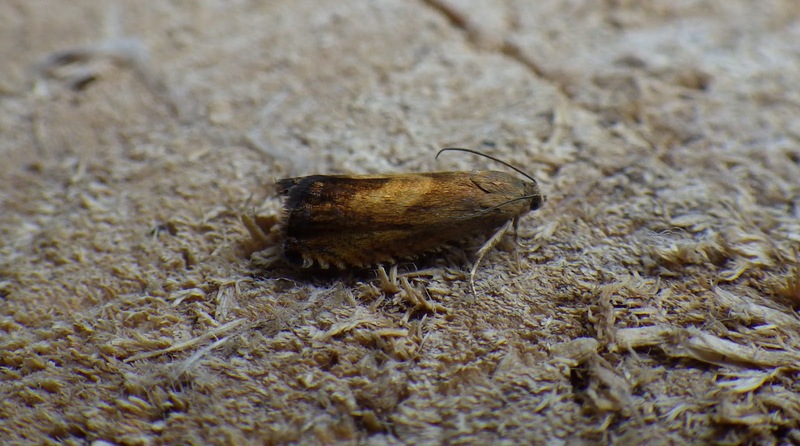 Finally, whilst doing some `moth catching up` this morning, I found an undetermined moth in the fridge that was caught in a trap set out in a suburban west Llanelli garden on 17/7 - Argyresthia pruniella. It is associated with cherry trees and, indeed, a flowering cherry is a few yards away from where the trap was placed. 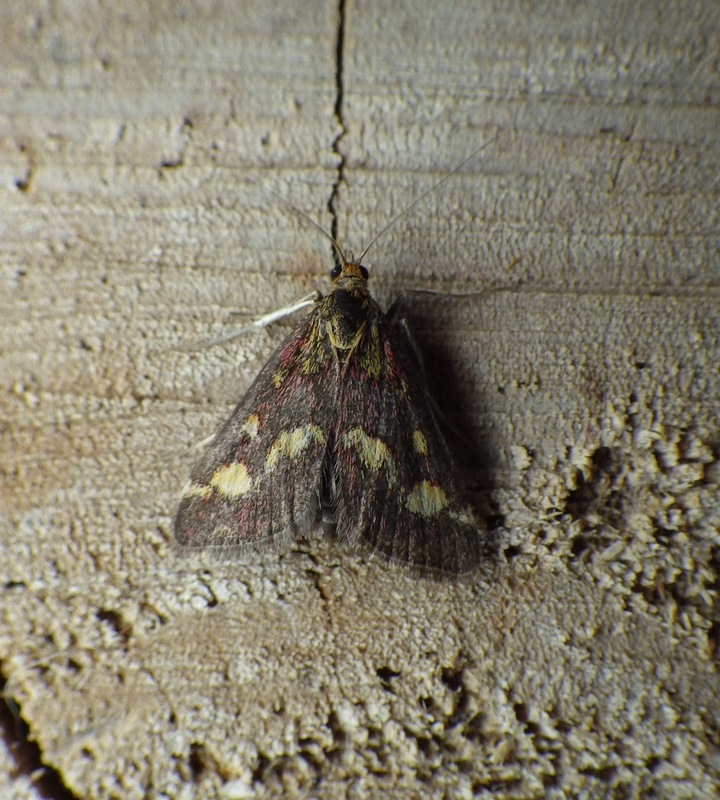 I also found a Batrachedra praeangusta from this site (as well as another moth to be looked at). Above: I believe that this is Argyresthia pruniella. Please correct if not so. Above: P. purpuralis (Morfa) on the left and P. ostrinalis (Tyrwaun, Pwll) on the right. Photos from above and below. All the little purple beauties, Ian? Having one is O.K. ; but all three is just showing off! Revisiting the Pammene, I now agree with Ian. Sorry!